Are There Health Benefits To Beer? Happily, Plenty. Well, Brian, this is what I have to say: If you’re planning a cookout this weekend like I am, don’t be afraid to knock back a cold one. 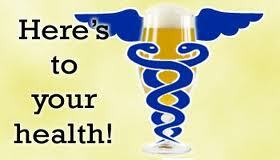 Beer has several surprising health benefits. Despite beer’s bad reputation, it actually has a number of natural antioxidants and vitamins that can help prevent heart disease and even rebuild muscle. It also has one of the highest energy contents of any food or drink. Of course, this means you need to set limits – one beer gets you going, four makes you fat. If you’re worried about dehydration, keep in mind that beer is 93 percent water. Also, according to a Spanish study, beer may actually provide better hydration than H2O alone when you’re sweating it out under the sun.